Always on the look out for a new cruise experience, I decided to book a Crystal ocean cruise to sail from Venice to Athens. The ship would call on the picturesque Adriatic ports of Split and Kotor, then head south for the Greek towns of Corfu, Katakolon, Navplion and Athens. Since I adore its charming watery maze, I planned to fly right after disembarkation to Venice for a few days of post-cruise R&R. Our first activity in Venice was an afternoon session with PhotoWalk in Venice. 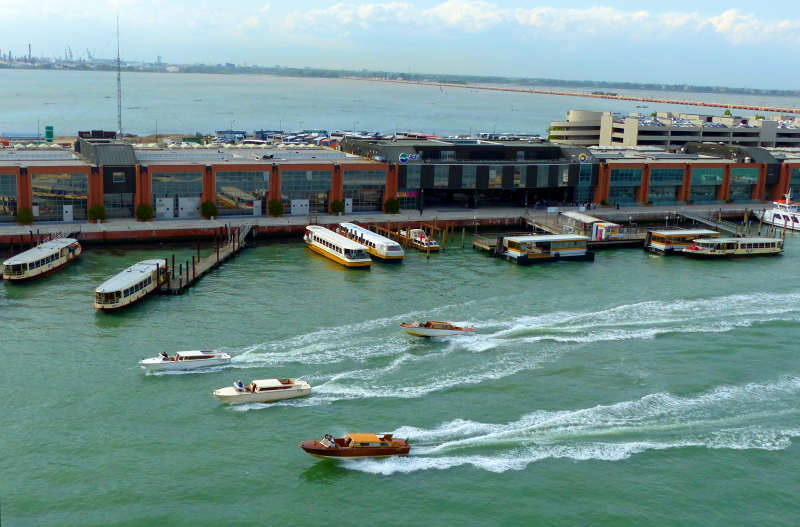 The tour, Venetian’s Venice, showed us where locals ply their craft, worship, live and play. Aside from the ever-popular Libreria Acqua Alta, we explored deserted calli (narrow and long Venetian streets), sun dappled campi (small squares), checked out a shipyard where gondolas are still being made, and strolled past traditional bàcari (small, local bars) popular with the neighborhood. 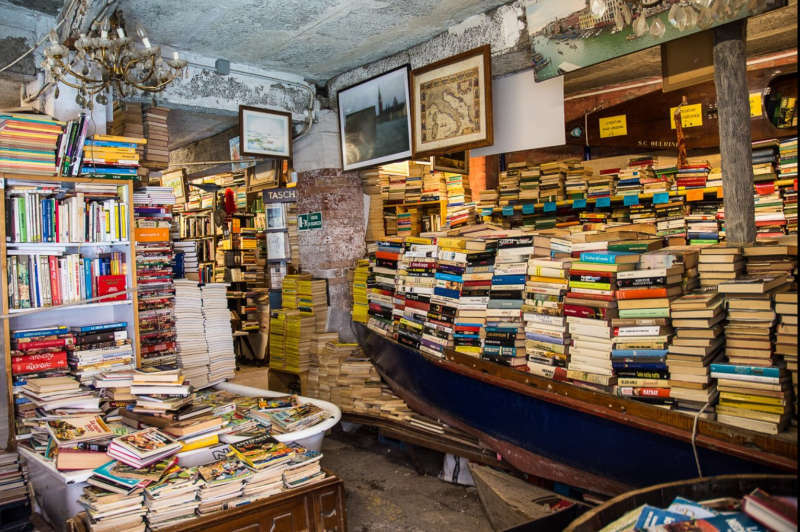 The legendary Libreria Acqua Alta. View of canal past the Santa Lucia train station. The ship overnighted in Venice, so we went back into the city after breakfast the next morning. It was great to see the sun glinting off two churches, the green oxidized copper domes of the Neoclassic San Simeone Piccolo, and Chiesa di San Geremia with its Bell Tower a bit further away. 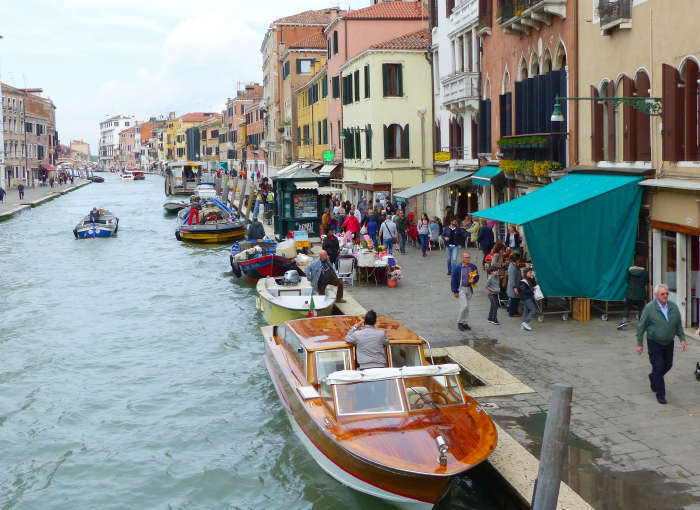 Bustling Fondamenta Cannaregio with all manner of public and private water transport. 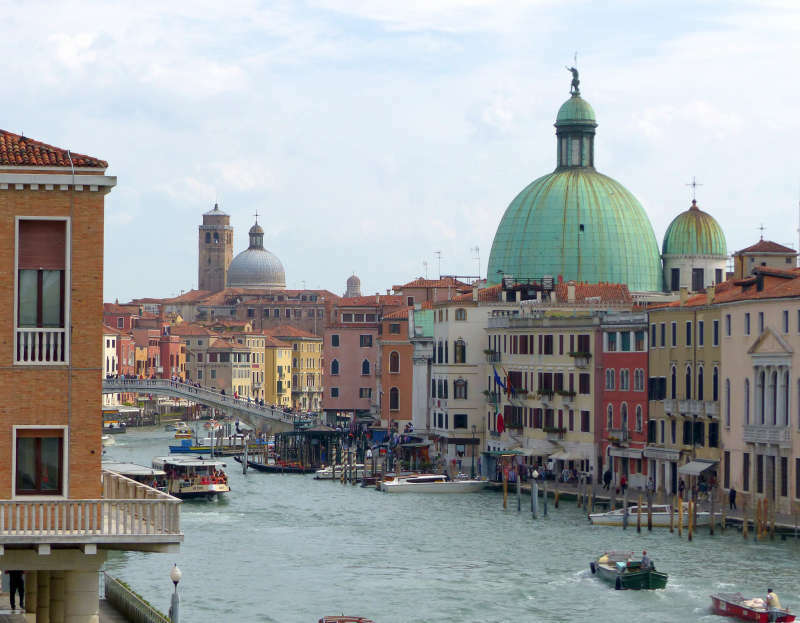 We crossed the canal via the historic Ponte delle Guglie, the only footbridge sporting a carved balustrade with decorative gargoyles, and wandered briefly into the Cannaregio sestieri (district). I want to check out the Rialto Market, known for its fresh produce and seafood. 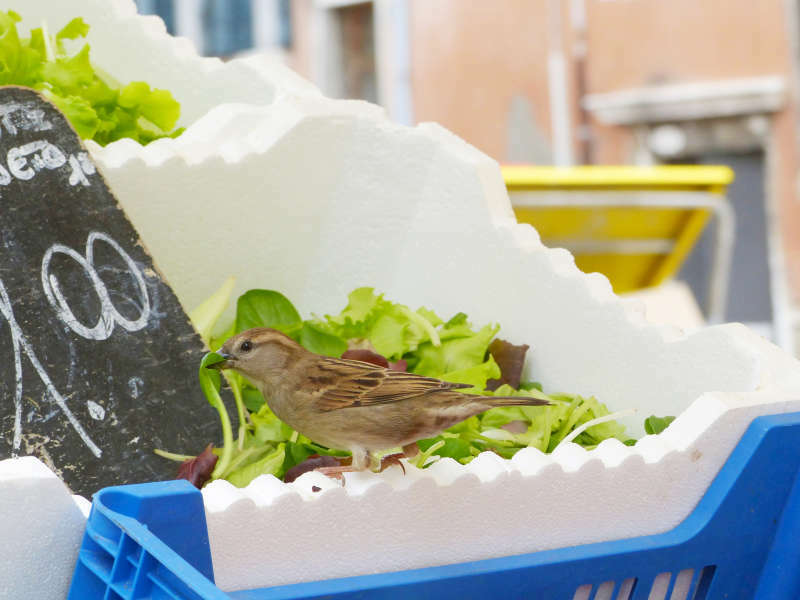 Apparently the sparrow knew that too! It hung nonchalantly around the stall and took off with its loot at the first opportunity. 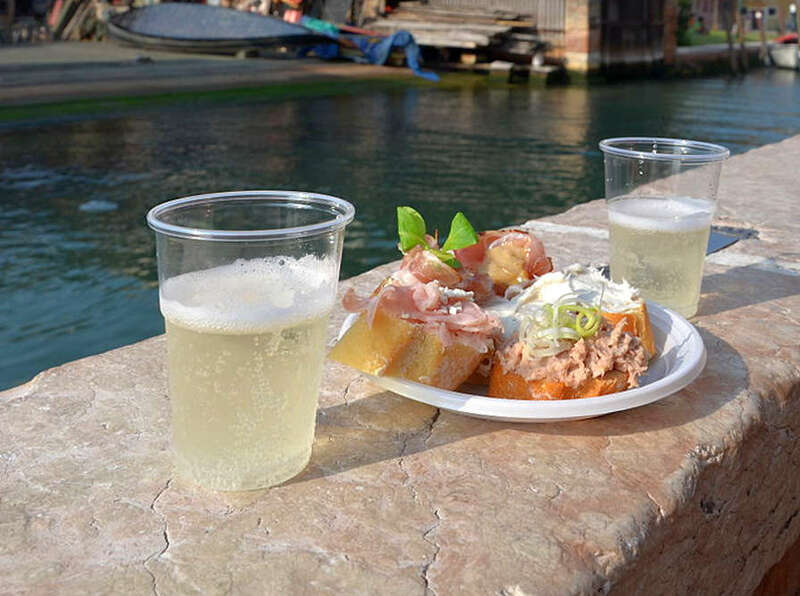 A popular pastime is pub crawling for cicchetti & prosecco. The bàcari, especially ones around the market, offer tasty cicchetti (think Venetian tapas) and wine for a song. One just has to brave the crowds and snag the food before it runs out. Because it’s a cheap eat, unless the bartender is in a good mood, or you’re a regular, your wine or prosecco will be served unceremoniously in plastic! Ubiquitous laundry waved over a rii (small canal). 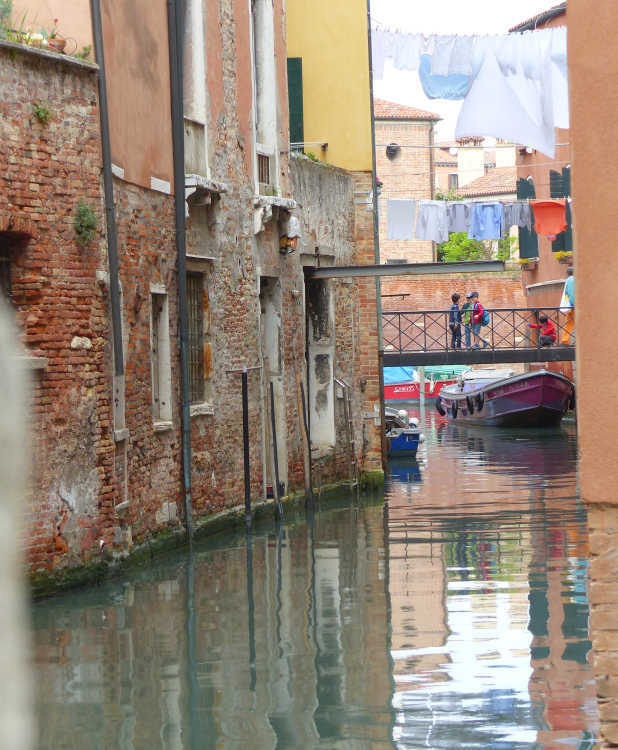 Something old, something new – the crisp, clean laundry hung in lively contrast to the craggy, ancient walls which silently withstood centuries of assault by the Venetian Lagoon. Couple in period garb, replete with masks and a lace umbrella! No this is not Carnival time. 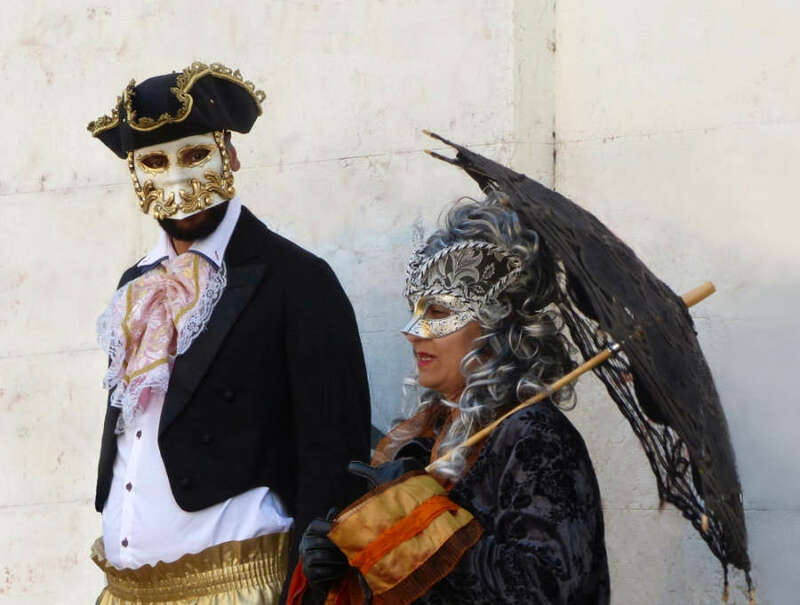 However concerts and performances in Venice are often promoted by folks dressed in period costume, so I assume that is the case here. 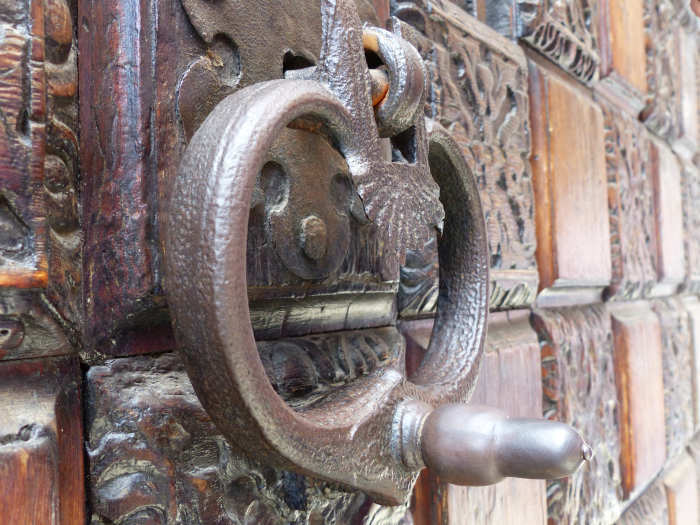 A exquisite gate with an equally elaborate knock. Love the rich textures and detailing of the wood and metal gate! 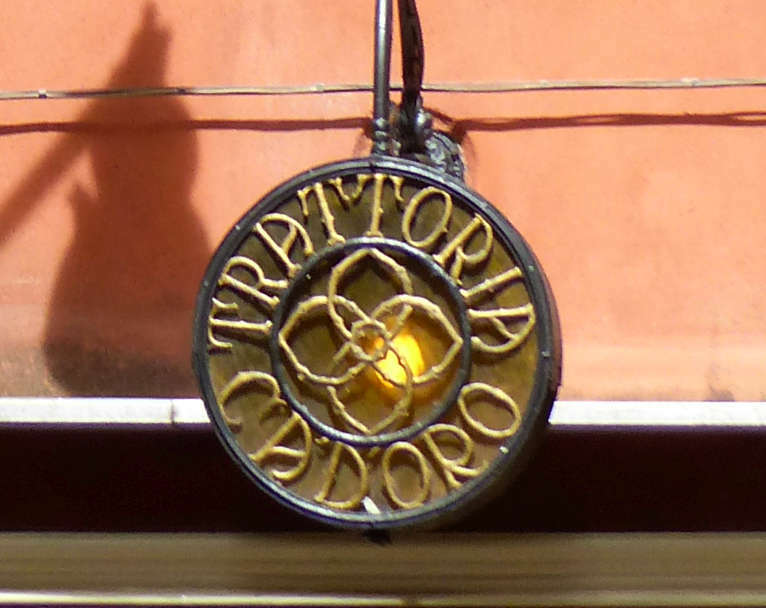 As we roamed the alleyways of Venice, this back lit glass sign above a trattoria caught my eye. Bird’s eye view of Piazza San Marco (St. Mark’s Square) at sunset. Being high up on the Crystal Symphony gave me a rare chance to take pix of Piazza San Marco across the water. 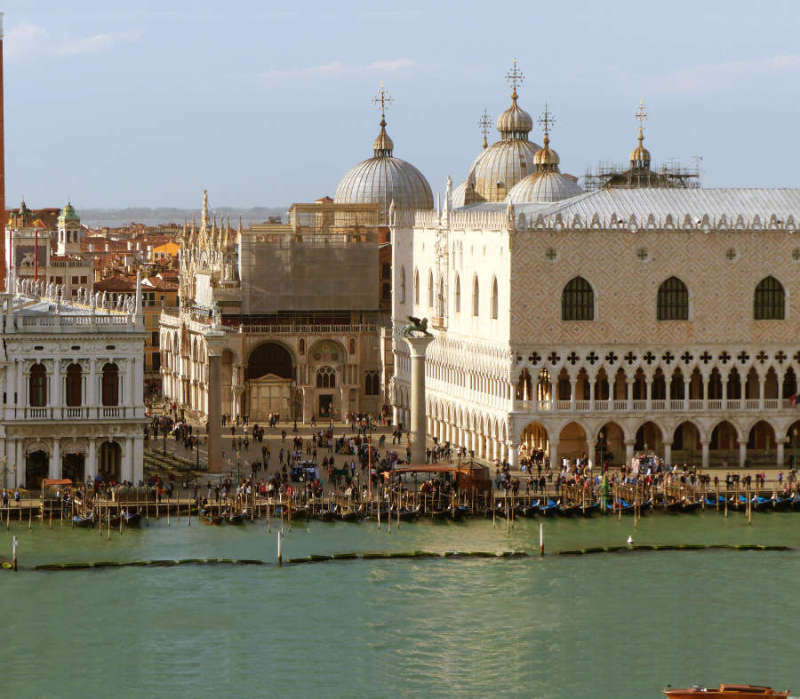 The celebrated St. Mark’s Basilica is flanked on the left by the Biblioteca Nazionale Marciana (National Library of St Mark), which holds some of the greatest classical text collections in the world. The library, a Renaissance masterpiece by Jacopo Sansovino, is housed on the upper floor with the flood-prone ground floor relegated to shops and cafes. To the right is the Palazzo Ducale (Doge’s Palace), the seat of power for the Venetian Republic in its heyday. 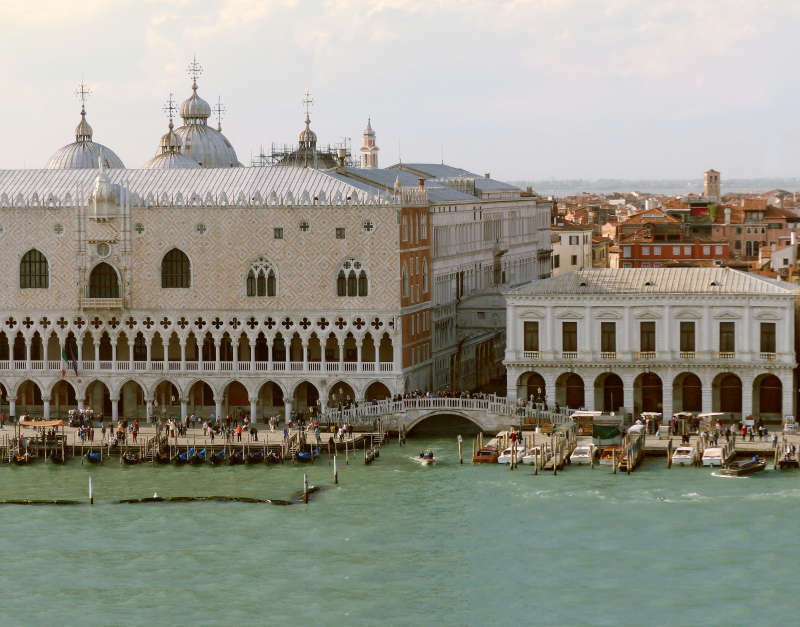 Tale of two Palaces – The Palazzo Ducale and the Palazzo delle Prigioni. Behind the bustling bridge on the waterfront is the iconic Ponte dei Sospiri (Bridge of Sighs) suspended above the Rio di Palazzo. Prisoners would be taken across the enclosed arched bridge from the Priggione Nove (New Prisons) to the Palazzo Ducale. The former prison, renamed Palazzo delle Prigioni (Prison Palace), is now serving a more uplifting purpose as a venue for concerts and other cultural events. This entry was posted in Architecture, Food, Travel and tagged Bridge of Sighs, Cicchetti, Doge's Palace, Libreria Acqua Alta, St. Mark's Square, St. Mark’s Basilica, Venice, World Heritage Site by Marie Chan. Bookmark the permalink.